HP announces revamped channel Managed Print Services programme: overview | Document Advisors | IDeAs blog, for better document strategies. Last week HP announced a new initiative oriented at MPS in the Channel i.e. serving the Mid Market. I credit HP on their ability to assess issues with current programmes and their energetic way to go and try to remedy it. Though the programme is world wide, this session was focussed on EMEA. HP’s competitors are going after channel acquisitions in EMEA and are buying market share or competence that way. One could question HP on why they are not doing the same thing, which has been seen in many industries, which have nothing to do with Print. It is called Vertical Integration in 40-year-old business books and is usually done when you reach a certain level of maturity in a market; this is seen as a clever consolidation move. HP has made a recent acquisition in the US with Printelligent, but more for the tools and the competence. HP on the whole seems to be reluctant to do acquisitions to get additional market share like some of its competitors do. So the aim of the HP Managed Print Specialist Resell Program is to serve the Mid Market, and to enable the Channel. It has many of the characteristics that you would expect in a well thought programme to serve this purpose, providing a good delineation between execution by HP and by the channel. Its aim is to provide a set of tools to be able to write, sell and execute on a contract. This saves the investment that the dealer would need to build what I coin as the “automation factory” needed to run MPS efficiently. It is clear for HP that in this mid market segment, the contract stays between dealer and end user client, i.e. this is not a “commercial agent” scheme. In our judgement, the programme is oriented on the “sales” side. Its focus is pre sales + sales, and enabling the assembly of audit information and transform of that into a viable contract and palatable offering. This is technically an MPS programme but it may end up resembling a good Cost per Print programme very similar to what Copier dealers do, if not exploited to the full by Channel partners. And by nature it is oriented at currently non-MPS savvy dealers. As our readers know, we, at IDeAs, differentiate precisely CPC and MPS, though the general market may not be quite as precise on that subject. The tool will generate all kind of reports but the “unaware” dealer is going to struggle to exploit them efficiently. One of the key aspects that dealers often miss is the dynamic Contract Lifecycle Management in the sense of new project creation (read additional revenue/ additional margin generation). It may include services like rationalisation, expansion, reduction, new apps, new functions, etc. within the contract’s life to bring more benefits to the client. HP makes in its offer a strong series of recommendations on Quarterly reviews and similar elements; help is also available to move things forward. But there is still a lot of work for dealers to make this a common process within their practice. 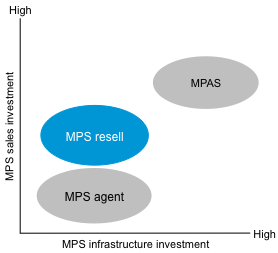 The programme has the ability to support multi-vendor offerings, but with some aspects stronger than others A dealer can bring in existing devices under contract (a similar option is already available in HP’s SPS programme) so he is not forcing the customer to revamp his fleet immediately. It is limited today to HP and Lexmark, which makes it a very printer centric programme. There will be a need to touch more aggressively copier-based pages as MPS, in the end, is about win or lose all. The pick up on the programme will be dependent, we think, on how this fits into the business dynamics of the dealer and that may vary significantly from one to another. It is a Manufacturer’s programme intended at selling in a contractual way and putting the estate under control. But the key to success lies not just with the tools, but depends critically on the correct execution. This is where the target dealer group is lacking in skills and experience. The most advanced MPS dealers are not the target group of this announcement as it is not what they need. They have already invested in similar tools, which are provided by independent parties, and they have paid for them. They have greater choices and they have built up the required processes to serve their clients and their strategy. The smaller dealers are not the target group either as this programme is already over complex for them, though this is not HP’s fault. It is to do with service contracts. That remains the “soft spot” of the market, especially for all those IT (read HP) dealers that have not yet endorsed the CPC/MPS wave. The tool is fine but what dealers who want to go actively after the services market need to do, is to build their company anew. No tool, no matter how clever, will enlighten them. Changing your business over is a matter of entrepreneurial culture. This has a strong cultural bias in European countries and this is why we read the map of EMEA differently than a manufacturer does. We believe in the agility of the channel to respond to customer demand, the choices in country deployment are made here by size and opportunity. But HP is large enough to be able to provide the programme to many EMEA countries, including the more business savvy ones. Bekend of echt iets nieuws…? This article was written on 01 Jul 2013, and is filled under Managed Print Systems.